My family just returned from a three-day visit to Zion National Park in Utah. It's a truly stunning place, with gorgeous views and scenery everywhere you turn, but if I had to pick a hike to highlight, it would be The Narrows, which can be enjoyed with even young children. We went with another family and there were four kids in our group, ages 6 to 9. The Narrows is the classic Zion hike, and it totally lives up to the hype. The hike takes place in the Virgin River, in the most narrow section of Zion Canyon. So you're basically wading through the flow of the river the whole time, with the walls of the gorge towering up on either side of you. It's pretty unreal. If your kids like splashing in water — and, really, what kid doesn't? — this is the hike for them. To access the Narrows from the bottom up (which is what you should do if you have kids, no permit required), you first have to take the park shuttle to the last stop, Temple of Sinewa (map of the shuttle route here), then walk down a paved, one-mile path to the trailhead by the river. The walk goes by quickly because it's downhill and scenic. We even spotted deer along the way. After reaching the trailhead, that's when the real fun begins. You enter the river and simply start walking through the water, against the current. You can go as far as you'd like, then turn around to head back. 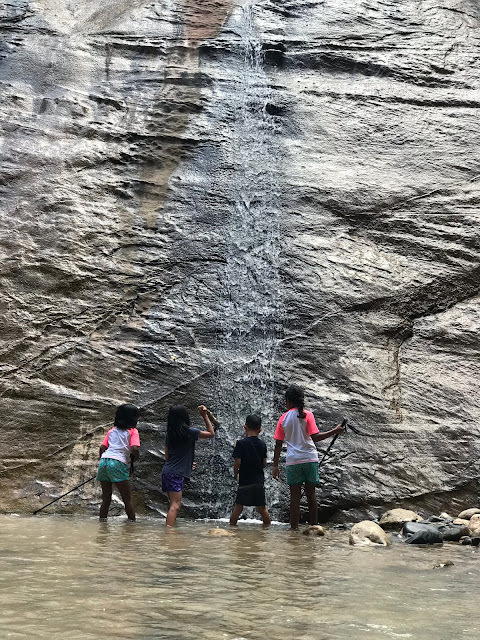 Most families with children get as far as Mystery Falls — a waterfall that seems to just come out of the rock — before turning back (map of the trail here). The water starts off ankle-deep and can get up to knee-deep on adults (or waist-deep on kids). You can, of course, go farther down the river, where the water rises significantly, but you probably won't if you have kids in tow. Allot at least 5 hours for the entire trip, including approximately 1.5 hours roundtrip on the shuttle, 1 hour roundtrip on the paved path to reach the trailhead, 2 hours roundtrip in the river, and half an hour for a snack break or lunch. Check this weather website for flood alerts in Zion, as rain will make or break this hike. You don't want to be anywhere near the river if a flash flood is likely. Plan to hike the Narrows in the early morning. Not only is the chance of thunderstorms less likely in the morning, but it's also considerably less crowded. We started at 8:00 in the morning, and there were just a few other hikers with us at that time. By the time we returned to the trailhead around 1:00 in the afternoon, tons of people were just getting in the river, and the scene was starting to resemble a water park. Zion's website describes hiking in the Narrows as "walking on slippery bowling balls," but I didn't find it to be that slippery. The bigger problem seemed to be finding your footing in general, as the rocks are all different shapes and sizes and it's easy to misjudge where your foot will land with each step. A walking stick definitely helps you keep your balance. Once you start on the hike, there's no way out except the way you came, so make sure you use the bathroom at the shuttle stop before starting. The most important thing you can do to prepare for the hike is wear proper shoes. Strappy sport sandals (like the ones made by Keen or Teva) or water shoes work well, and it's super important to have a hard, closed toe because you'll be stubbing your toes against the rocks a lot. You may also want to consider wearing neoprene socks to keep your feet warm, as the water stays cold even if the temperature outside is in the 90s. If you'd rather not pack all these things for your trip, you can rent them all from a local outfitter like Zion Adventure Company. Assuming that you're hiking in the summer, it's not necessary to rent dry pants or dry suits. As for your kids' clothes, I recommend a rash guard and swim bottoms, as they'll likely be getting wet. It can be cold when you're first starting out, though, so a cover-up is probably a good idea. It can also get sunny and hot as the day goes on, so hats are also a good bet. The four things I'd recommend bringing in a lightweight backpack are bottled water, snacks, a camera, and a walking stick (although you may get lucky and score some abandoned sticks at the trailhead). There are spots along the hike where you can sit on elevated rocks and take a break, so that's when you'll get to eat your snacks. Make sure you bag everything in Ziplocks so that they don't get wet if you fall — it's entirely possible that you will! We also packed a lunch to eat after the hike was over. We enjoyed our sandwiches and chips at the Temple of Sinewa shuttle stop (there are many benches available there) before climbing aboard the bus to head back to the visitor center. Check out my more detailed itinerary for visiting Zion National Park with kids for other family-friendly hikes in the park.